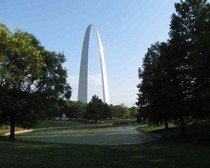 The Gateway Arch stands tall in St. Louis symbolizing the westward expansion of the United States. Let us check out some very interesting facts about this tall monument. The Gateway Arch is a part of a bigger picture known as the Jefferson National Expansion Memorial Park. The park was established to commemorate several historical events including; the Louisiana Purchase, and the subsequent westward movement of American explorers and pioneers, the first civil government west of the Mississippi River and the debate over slavery raised by the Dred Scott case. 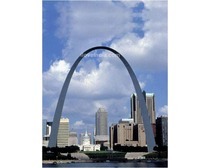 The Gateway Arch or the Gateway to the West has become the iconic image of St. Louis. There are some very interesting things about the Gateway. 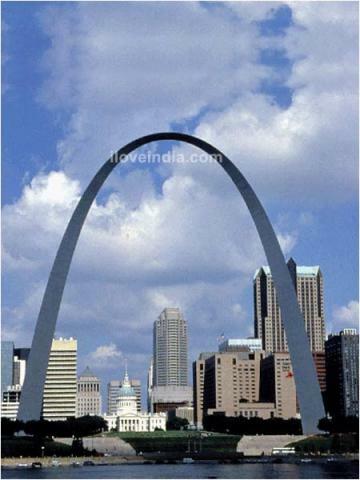 In the following lines, explore interesting and fun facts about the Gateway Arch. Standing at a height of 630 feet, it is the tallest monument in the United States. The San Jacinto Monument in Texas is way too far down at just 570 feet and The Washington Monument is still shorter at 555 feet. The design for the monument was chosen through a design competition in the year 1947. The number of competitors who competed was 147. The competition was won by Eero Saarinen, a Finnish American architect and industrial designer. He was famous for varying his style according to the demands of the project. Eero Saarinen’s designs involved simple, sweeping, arching structural curves or machine-like rationalism, which is evident in the Arch’s design too. Though it was Saarinen’s design, structural engineer Hannskarl Bandel was the one who modified the inverted catenary shape, so that it could be reproduced in reality. When Saarinen tried to exhibit his preferred figure with a chain suspended in his hands, he couldn't realize the faintly stretched out, "soaring" effect he wanted; Bandel asked for the chain and returned in a few days to delight the architect by producing Saarinen's exact ideal curve, as if by magic. Bandel calculated the force of wind that would affect the structure. He then replaced some of the constant-sized links with variable links and added weight to the first 300 feet of the arch and placed 25,980 tons of concrete in the arch's foundation so that the center of gravity would be lowered to a stable location. A very important factor that Saarinen had missed. The structure is as wide at its base as it is tall, i.e. 630 feet and it is the tallest habitable structure in Missouri. The structure took more than two years to build, starting on February 12, 1963, and ending only on October 28, 1965. Contrary to appearance, the cross section of the walls actually forms equilateral triangle, which has a side length of 54 feet at the bottom, while the sides reduce to 17 feet at the top. Each wall is actually made of stainless steel skin covering a sandwich of two carbon steel walls with reinforced concrete in the middle from ground level to 300 feet and carbon steel and rebar from 300 feet until the top. The interior structure houses two stairwells of 1,076 steps each for emergencies. The base of each leg at ground level had an engineering tolerance of one-64th of an inch (0.40 mm) or the two legs would not meet at the top. Despite such measures, the thermal expansion of the sunward-facing south leg prevented it from aligning precisely with the north leg. The St. Louis Fire Department then continuously drenched the southern leg with water till the alignment was corrected. The keystone in the structure contains a time capsule retaining the signatures of 762, 000 St. Louis area students. It was welded into the keystone before the setting of the final piece. There is a tram service for people who want to visit the observation on the top of the arch. The tram itself is a train like structure made of 8 unique egg-shaped elevators, which takes 4 minutes to reach the top and 3 minutes to come back down. The tram is operated by the Bi-State Development Agency, under an agreement with NPS. The visitors can take a tram from either the north end or the south end of the arch. There is a tram running up and one running down simultaneously and 80 passengers can travel at one time, i.e. 40 on each train. The observation area is an arched structure too. It has 16 windows on each side and all the 32 windows have the same dimension of 7 by 27 inches. On a clear day, it can offer a view of up to 30 miles.